I moved to Missouri in the summer of 1988, having experienced 8 years of generous support of my family’s livelihood by my research on the infamous imported fire ants of the US Southeast, and their relatives in South America. When I arrived in the Midwest, I hoped to land a job as an insect taxonomist in a university or museum, a goal of mine since before entering college. But this dream was one that even before moving to Missouri was dimming, and then receded ever further from the realm of possibility for me (and for traditionally trained taxonomists, generally), once here. So, I began to re-think what I might do with my work life. It would be something, I hoped, that would make some use of all the course work (mostly in entomology and botany) and research (on ant systematics) I had done during my 24 years (!) of getting educated and four additional years as a post-doc. As or more important, whatever job I ended up in would somehow have to allow me to share my life-long love of nature with others. 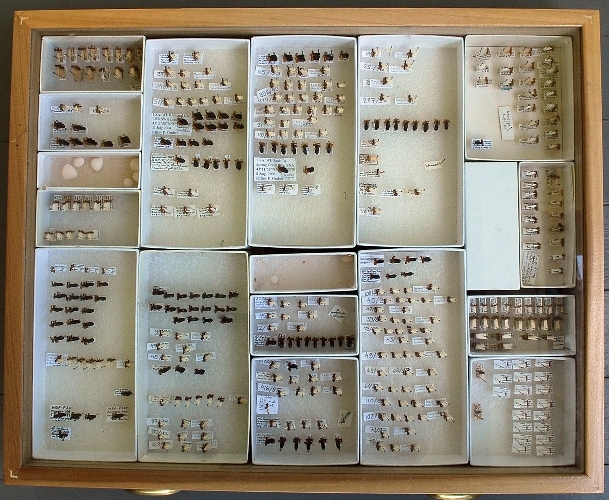 A museum drawer of ant specimens mounted for taxonomic study, the ants no doubt frustrated by the years of inattention they have received as I have tended to the duties of my day job. Early in my residence in eastern Missouri, I made the acquaintance of the naturalist at a 2500-acre (1000-hectare) nature reserve outside of St. Louis. Shaw Arboretum, as it was then known, is country cousin to the world-renowned Missouri Botanical Garden, and is named after the Garden’s founder Henry Shaw. Long story short, in the summer of 1990 the naturalist mentioned to me that he would soon retire, the position would become available, and that I ought to apply. So I applied, and was hired as the arboretum’s naturalist in January 1991. 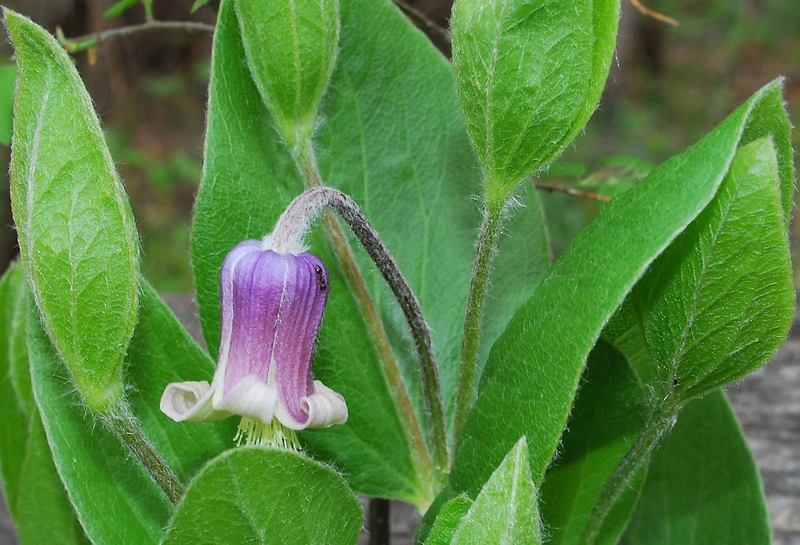 A dolomite glade plant endemic to a few counties in eastern Missouri, this leatherflower was established at SNR in the 1930s, but expanded exponentially after prescribed fire was introduced in the 1990s. Here, an ant characteristic of glades and dry prairies forages on the flower. When I came on board, the “Arboretum” had mostly ceased to be an arboretum (a formal collection of trees for display, breeding and research), and most folks seemed unable to either pronounce or define the word. Indeed we learned, through a public survey, that the strange name and the stone wall in the front actually dissuaded people unfamiliar with it from entering! Yes, there were a few patches of exotic trees scattered around the property, especially in the conifer collection near the front entrance know as the “Pinetum”, but ever since the Garden had decided around 1930 that it would not, afterall move all of its horticultural operations to this then very rural site (the original intent of its purchase), formal arboretum and botanical garden type activities had been few and far between, and the site began gradually reverting from abandoned farmland to a wilder sort of place, as well as a haven for native biota. Thus, on its 75th anniversary in the year 2000, Shaw Arboretum was renamed Shaw Nature Reserve. 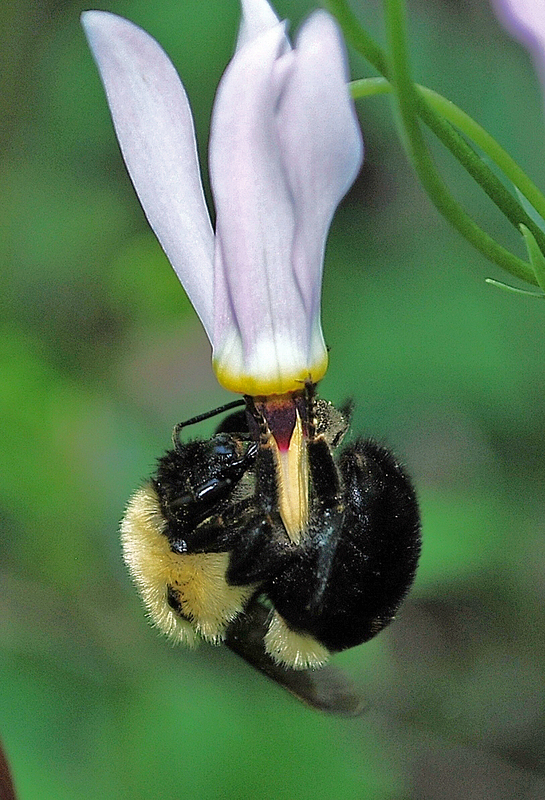 Colony-founding queen bumblebees are the primary actors in loosening pollen with ultrasound from shootingstar anthers, and distributing it about the plant population. Around that time, my title changed too, to “Restoration Biologist”. The job is multifaceted; presenting public programs and classes on various aspects of the site’s natural history, writing and reviewing articles, acting as liaison to the vigorous regional group of academic ecologists who use the site for research and teaching, a very intermittent personal research program on ants resulting in sporadic publications, and last but certainly not least, ecological restoration. Restoration of a natural community to structure and species composition presumed characteristic of an ;;earlier condition (however arbitrary or ill-defined). 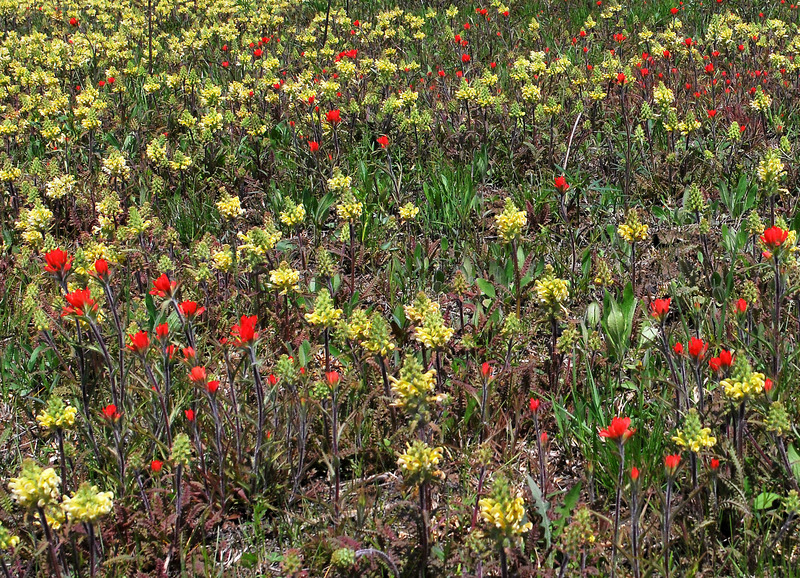 Reconstruction of regional, native-like habitats, de novo, using locally acquired native plant propagules in the appropriate settings of soil, hydrology, slope aspect and climate. Both require essentially perpetual, follow-up maintenance, including invasive species control, mowing, haying, grazing, selective timber removal, species richness enhancements, and prescribed burning. 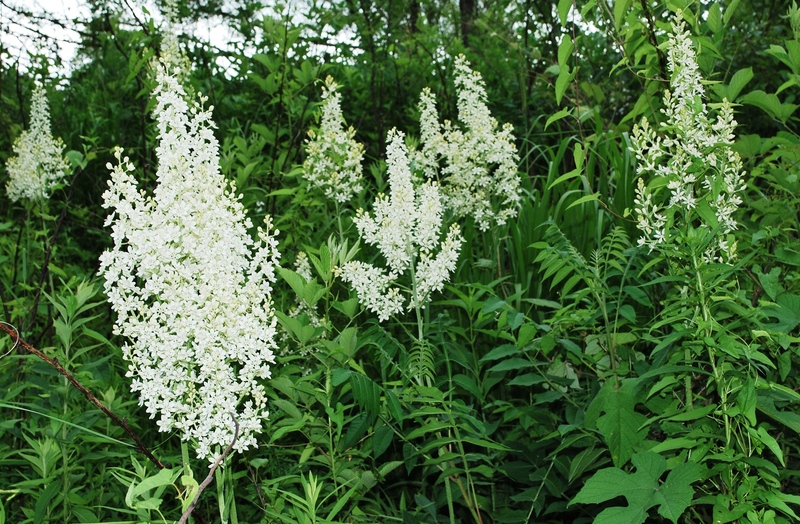 All of these have many variations and nuances in application, and there can be impassioned arguments about their implementation in the literature, at conferences, and in forums and blogs on ecological restoration, native plants, butterflies, beetles, etc..
An ecologically conservative lily ally of undisturbed moist soil habitats now thrives in prairie plantings at the Reserve. Attitudes about ecological restoration vary, among practitioners, among sociologists and philosophers, and in the general public. One broad attitudinal schism lies along the lines of whether ecological restoration activities are some sort of primitivist, grand-scale gardening, or do they represent ecologically valid landscape conservation? Another question some pose is to what extent we should interfere with “natural successsion”? Be this as it may be, most people with functioning sensory perception agree the results can be very beautiful. The loveliness of the mosaic of colors in the herb layer of a spring woodland is inarguable, especially so after it has had its woody stem density reduced, and had the leaf litter burned off, to allow more light, rain and seeds to the soil surface — even where there is genuine concern about damage to invertebrate assemblages residing in forest duff. A waving meadow of grasses and flowers in a tallgrass prairie planting, intended to replace just a few of the tens of millions of acres of this ecosystem that have succumbed to the plow, has its own grand beauty, though its per-square-meter species density of plant species remains less than half that of a native prairie remnant and it is dominated mainly by habitat-generalist insect species rather than prairie specialists, even after 30 or more years. 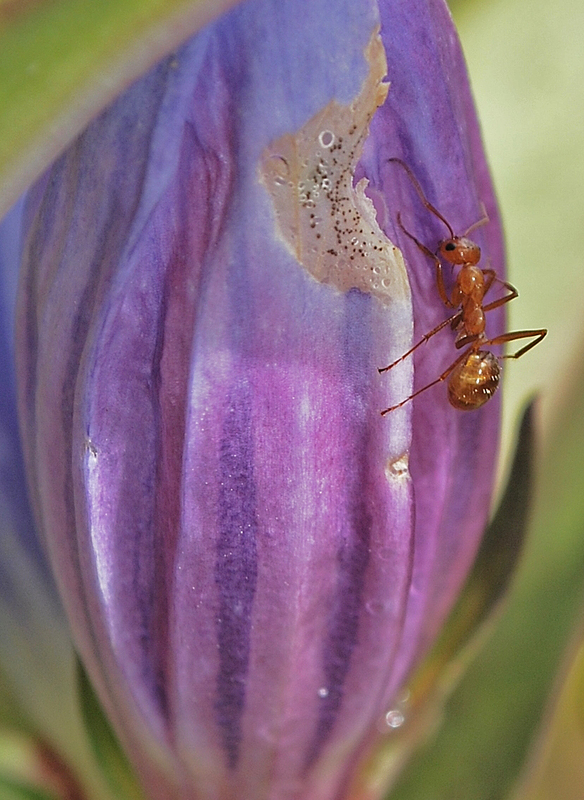 A self-introduced grassland ant forages among a thriving, human-introduced population of this wet prairie gentian. The smaller, daily rewards of restoration, to the practicing ecological restorationist and to those who visit his or her work, are many. Over 20 years, in the opened-up woods, restored glades and prairie and wetland plantings at SNR, I repeatedly have enjoyed the “sudden appearance” and increase in populations of ant species (of course) that I never observed during my early years of working at SNR (then scouring it for purposes of preparing an annotated ant list). The feeling I get upon discovering that a grouping of shooting star, royal catchfly, bunch flower or bottle gentian plants, are in bloom at a site where I spread their seeds five, seven, or even ten years earlier is a bit like that one feels when a child is born. The spontaneous colonization of SNR grassland plantings by prairie ragged orchid never fails to amaze me. 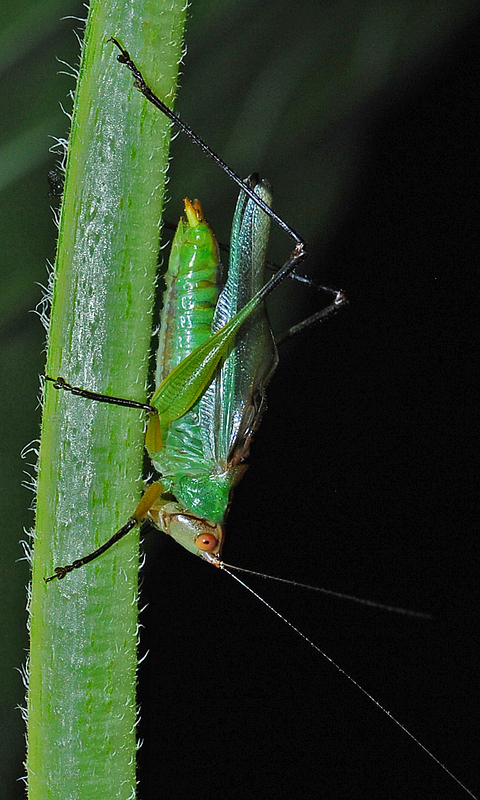 Bird, or frog, or katydid and cricket songs in a former crop field or pasture, as the “restored” vegetation fills in and matures, is as pleasing to my ear as it is to my soul. 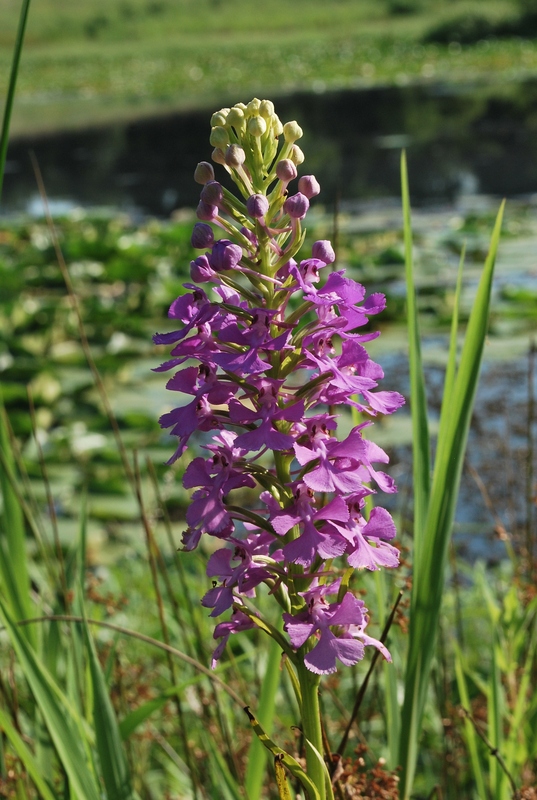 A few days ago (in early July), the director of the Reserve came to my office asking if I had noticed a purply pink, “possibly orchid” flower growing on a section of a berm (planted with native vegetation) in our 32-acre wetland complex. I had not been in the area recently, but headed right out to see what it was. Joyously, and not a little surprised, I learned that seeds of the purple fringeless orchid, sowed at a location nearby 17 years previously, had washed to this site, taken root, and as terrestrial orchids are wont to do, flowered after so many years! 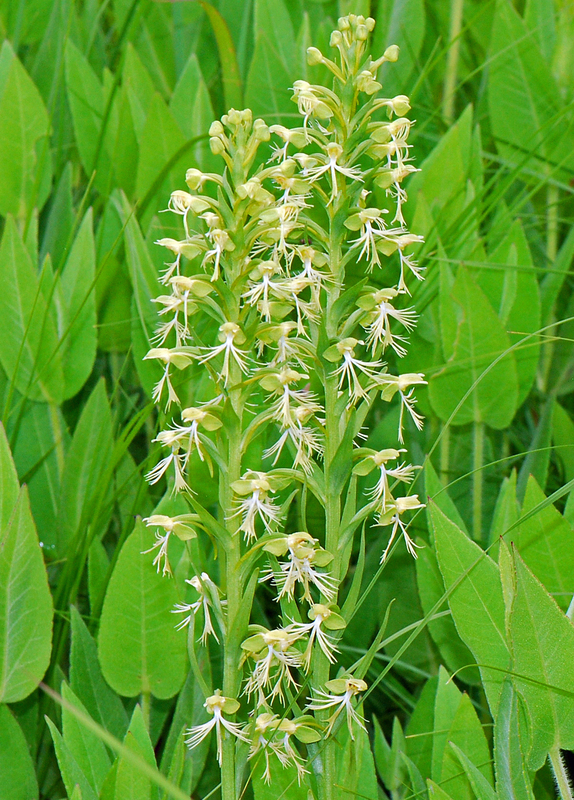 The prairie ragged orchid began to appear in old fields and prairie plantings where prescribed burning occurs at SNR. It has not been seen in fields maintained exclusively by mowing or haying. The purple fringeless orchid surprised the restorationist and St. Louis area botanists by flowering in the SNR wetland area 17 years after the original sowing. This entry was posted in Formicidae, Gentianaceae, Hymenoptera, Liliaceae, Orchidaceae, Orthoptera, Plantae, Primulaceae, Tettigoniidae and tagged Botany, ecology, entomology, habitat management, insects, katydids, Missouri, nature, orchids, science, wildflowers. Bookmark the permalink. It must be a very satisfying job indeed! A sort of hopeful but chaotic gardening on a grand scale, with a natural succession being expected rather than denied. In my small garden in the suburbs I have removed all the lawn and replaced it with a selection of hardy shrubs and perennials – not all of which would be described as ‘native’. Yet it draws in the bugs and birds and it always gives opportunities for observations and photography – just by stepping out the front door. Very satisfying! I saw my first St. Louis-area Henslow’s Sparrow at the Arboretum prairie in 1996. There was a lot of excitement about Henslow’s that year among local birders. My only other one at that time was seen at Prairie State Park, about 270 miles to the west. I always learn something at Shaw Nature Reserve! The Henslow’s sparrow population at SNR continues to return and is growing slowly. Last summer we had at least seven breeding pairs. This year there may be only five pairs, but still nice to have them. The Reserve is a local hotspot for brushland and open wooodland birds, as you know, Anne. I love to read restoration success stories. Even if people can’t agree on the definition of Ecological Restoration or the best methods to use or benchmarks to use for evaluating success, we should all agree that the results can sometimes be spectacular. It has to be a very satisfying feeling to view the results of all of your hard work. I commend you for your efforts. Hats off to you and the amazing staff of Shaw Nature Reserve! This is definitely a milestone in restoration and another complement from the plant world for all the blood, sweat, science, money and know-how that has been applied to this most fortunate piece of ground. I’ve seen many restorations/reconstructions at many places over the years and none are as well conceived, orchestrated and delivered as those at Shaw. Thanks for restoring hope. Thanks so much to all who have responded, here or elsewhere, for the feedback. Adrian — I recently moved, after 19 years of living at SNR, and have begun converting the boring lawn and honeysuckle-infested wooded corner of my lot into better critter habitat. It is a wonder to watch the pollinators arrive or spiders spin an orb on a patch of flowers planted where there was no evidence of them or their animal inhabitants only a few days before. Great post, James. What a nice blend of natural history and human foibles. Nice, James. Is that Formica biophilica? Close — This one is F. incerta. They are yellower to the south, but note the brown cast of the gaster. I visited the Shaw Arboretum back in the late ’90s on my way back home from a job interview in Jefferson City. Didn’t get the job (there must’ve been close to a hundred applicants there! ), but I sure did enjoy my brief tour through the Arboretum. I had wanted to see The Prairie so badly while I was there, but sadly all my driving back and forth across the state yielded mostly one-acre blocks scattered in urban (or near-urban) areas. Hence my stop at the Arboretum where I could see another patch of restored prairie. Unfortunately, it was early spring, so there wasn’t really much to see. Even so, I really did enjoy my visit, and I greatly ejoyed reading this post. Great article! I have been lucky enough to live within a few miles of SNR for the past 7 years, and have found it to be a really unique place. It seems to serve a function which is precisely complementary to that of the main MBG downtown. Rather than thousands of fastidiously tended and managed beds, most containing spectacular exotics, SNR offers an incredibly rich variety of Missouri native species, nearly all of them growing (and self-propagating) in a natural environment. This makes SNR a fantastic laboratory for learning MO’s native flora; I know that I have benefitted enormously. This unique nature laboratory has been brought to beautiful fruition by your efforts. Well done indeed!